Prim and proper, yet still filled with vim and vigor, Ian McKellen cuts a dashing figure as 93-year-old Sherlock Holmes, retired to a village near the sea in 1947. Having outlived his contemporaries, the detective busies himself with beekeeping after his return from a trip to Japan. His housekeeper Mrs. Munro (Laura Linney) is well-versed in his habits, and knows better than to exceed her assigned responsibilities. but it seems that her young son Roger (Milo Parker) is starting to assert his increasingly strong-minded personality. He begins to question Sherlock, and quickly becomes the old gentleman’s constant, curious companion. Roger’s inquiries about an unfinished fragment of a story begun by the detective nudges him toward memories that have long been set aside. His final case was left unsolved some 35 years in the past, its particulars fictionalized by his good friend Dr. John Watson. Sherlock desires for the truth to be known but his power of recall has failed him. He undertook an arduous journey to Japan in search of a certain plant, said to help memory, but now that he’s acquired it, it doesn’t seem to do much good. Instead, it’s the curiosity of Roger that starts to bring back those buried memories. Sherlock took the case of Thomas Kelmot (Patrick Kennedy), who is concerned about the mysterious actions of his dear wife Ann (Hattie Morahan). Sherlock pursues an investigation that is ruled by his rigid, world-famous logic and deduction. He knows that the resolution of the case is what prompted him to take an early retirement, one that has left him alone and (usually) distant from anyone he has ever known, but he struggles to remember exactly what it was that motivated him to make such a wrenching decision. Even more than the what, however, Sherlock struggles with the why. Facing the end of his life, and acutely aware of his slowly failing physical capabilities, he fears that his reduced mental facility will mean that he will never, ever solve his final case, which is a source of great anxiety and melancholy. Ian McKellen’s performance is consistently engaging and delightful to behold, infusing the old detective with a wonderous variety of characteristics that help to define a very unique personality. He is ably supported by the superb Laura Linney and young Milo Parker, who each contribute strong turns. 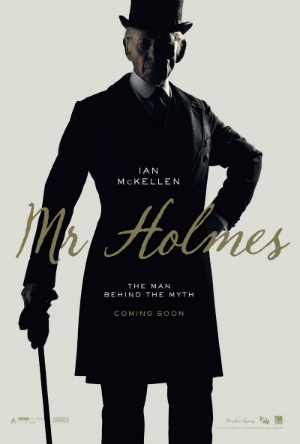 Mr. Holmes is well-directed by Bill Condon, who previously worked with McKellen on 1998’s Gods and Monsters. Condon earned an Academy Award for his screenplay on that picture, but the script here is by Jeffrey Hatcher, based on a novel by Mitch Cullin, and it is very slight indeed. It has a good structure, but it lacks much meat or mystery. As a result, Mr. Holmes is too slender to provide much nourishment beyond the pleasure of the performances. That makes the movie easy to watch, yet also easy to forget. The film opens on Friday, July 17 at the following theaters: MC Village on the Parkway, Addison; AMC Parks @ Arlington 18, Arlington; Angelika Film Center and Cafe Dallas; Grapevine Mills 30; Legacy 24, Plano; Angelika Film Center and Cafe Plano; and SouthLake Town Square 14.